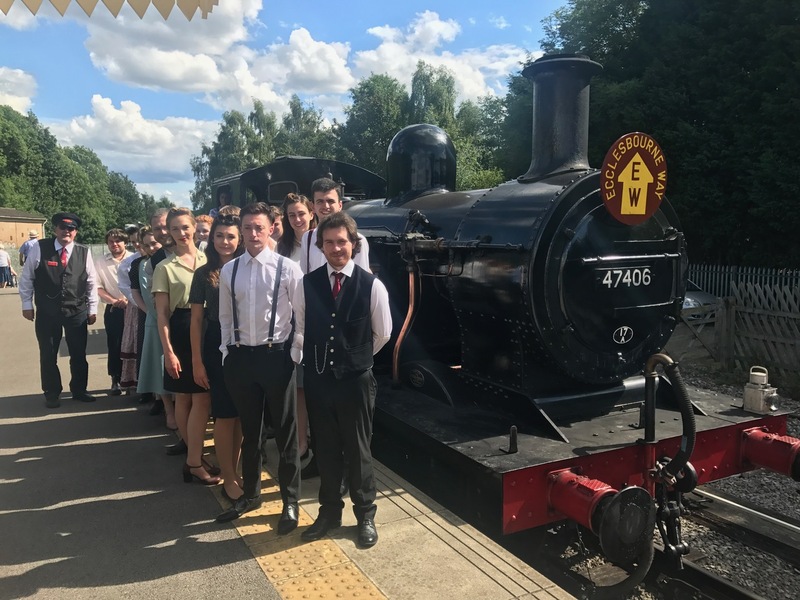 As the curtain comes down on July operating days, people continued to enjoy the Jinty operating services on the Duffield line. I think people were in a shopping mood today as a very strong retail performance was recorded for the third time this week. Passenger numbers were good again today boosted further still by two parties, one of which enjoyed Afternoon Tea in the Pullman as well. Down the yard, the Class 33 had the defective driver's gauge lights looked at and a faulty drain tap repaired. Another wet and miserable day but it didn't deter the passengers and we had quite a reasonable day on the train. The converted wheelchair space in Iris came in to it's own today with several passengers making use of it. It was also good to see another day of strong retail performance. The Maintenance Team continued working on Barry the PWay Bubble which was taken to the car park for fitting of an overhauled gearbox. Photo attached. 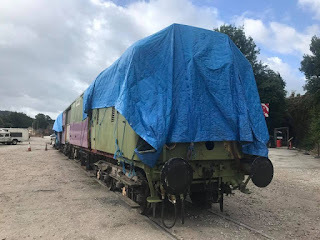 It might not be looking at it's most beautiful, wearing weather sheeting, but lots of progress has been made in the background sourcing and overhauling parts sponsored under the Bubble Appeal by our shareholders and the Aviva Community Fund grant. Lots of bodywork, most of it hidden under the panels, has also been undertaken. This afternoon, with the heavens open, the team retreated to the luxury of the new shed to continue working on the Leyland 680 engines which are nearly ready to be fitted, with one receiving an overhauled CAV injector pump. As July nears the end, we saw a DMU service day which was reasonably well supported. Down the yard, the Maintenance Team fitted a refurbished gearbox to the PW Bubble as they start to return components to the underframe with a view to getting it mechanically back together. Another team worked on the Derby Lightweight restoration, scraping and painting the power car's underframe. The rain held off to provide another good day in the valley, with many people young and old coming for a ride behind the visiting Jinty. Following the speedy replacement of the two vacuum cylinders yesterday, it was good to see the bar car back on the train. Indeed one couple said that they only purchased tickets to enjoy a drink at the bar! Down the yard, more stripping out of parts of the RF kitchen car was done and work to begin to reconstruct the air system on Derby Lightweight power car 79018 took place. Needle gunning of the sole bar at the front on the PW Bubble also took place as a follow on from yesterday. A start was also made on trying to trace a pesky fault with the Class 119's saloon lighting which has been around for some time. Just a reminder that the B5023 Wirksworth Road is closed at the southern entrance to Wirksworth adjacent to Haarlem Mill this week from Monday 24th until Friday 28th July. This will affect visitors and staff coming to Wirksworth Station from Duffield/Cower's Lane. Other routes into the town are unaffected. Visitors and staff coming from that direction are advised to seek an alternative route. Another damp day saw a group have a ride on the train, once again necessitating the need to upgrade to the 3 car DMU set. It is pleasing to see mid-week train services busy as well as the weekend. The Maintenance Team performed a mid-season examination on the coaching stock as they are doing quite a lot of miles this season. This important work will help to ensure trouble free running going in to August. A very wet start to the day but it brightened up later. Our DMU service was upgraded to a 3 car today due to a large party who also enjoyed a hot meal in the Pullman. Down the yard, Tom the shunter had some routine maintenance and an air leak sorted out and the new shed was swept and kept looking good. The PW team unloaded lots of sleepers that they had taken out of the line at Wirksworth so they can be sold. Some already have been! Then the works train was tripped to Shottle before the services started. They then returned to Wirksworth by road and repaired the main gate as well as cleaned, adjusted and greased the Wash Green Ground Frame. Many people enjoyed sitting on the platform, buying from the BBQ or looking round the stalls. Work continued on the RF, whilst the new pulley wheel was fitted to Faraday's new donkey engine. Thank you and well done to all concerned. Today was the first day of our two day classic transport weekend which fetured a lovely selection of classic lorry's, cars and bikes on display. The weather remained overcast but dry all day for the event. Passenger numbers were really good all day and the car park was full. The services today where both steam hauled and were being handled by the visiting Class 3F Jinty which was on the Duffield service and No3 was out on Ravenstor. There was plenty of activity down the yard the LMSCA were working on the LMS BTK fitting the pass com chain a job the requires alot of patience and also fitting the wooden trim that covers the pass com area which has been cut measured and made from scratch. It will be a lovely addition to the coach fleet once complete. Further down the yard Jason did a sterling job of washing the class 33 to keep it nice and presentable for the Tuesday loco hauled services. The 119 had its repaired vacuum exhauster refitted this has had a new oil seal fitted to it as it was bypassing oil and spraying it all over the surrounding area damaging the rubber alternator belts which were perishing. In the shed the 8f group continued there work on the Duke sadly I didn't catch up with them to find out what they had been upto but im sure Tim will update us on that. Also in the shed Faraday was lifted so the defective bearing could be removed from the axle box. Sadly the team couldn't lift it high enough to release the bearing as they didn't have enough packing but fingers crossed next weekend with some extra packing and 2 extra jacks they will be able to release the bearing and carry out the nessesary repairs. Hopefully another successfull day tommrow for day 2 of our classic transport event. A twinge busier than yesterday but I suspect it's the calm before the storm once again with the Classic Transport Weekend this weekend. The steam team came in to light their engines ready and the coaching stock was cleaned inside too. Work continued in the shed on the CK and the Class 31 received a bodyside wash. Some like the 'weathered' appearance but it is important to present a clean look for the general public. The Miniature Railway had more track ballasted today ahead of their running days this weekend. A day broadly similar to last Thursday in many respects. The train service ran to the Blue Timetable, our midweek diesel railcar service. Down the yard, the Maintenance Shed was shunted to allow the courier van which is having a quick coat of paint to tidy it up to be moved across to the other side. This also tied in nicely with the CK needing to be transposed too. The Miniature Railway had some tidying and clearance work done ahead of this weekend's running at the Classic Transport Weekend. That little steam engine is quite cool! You can get miniature and full sized steam at this weekends event, with both the Duffield and Ravenstor line having steam locomotives running. There'll be a good selection of classic road vehicles on display in the car park too. Yet another warm sunny day with the 'Jinty' running passenger services to Duffield. Today we hosted the Pomegranate Theatre who had specially produced a performance about our railway. It started off with scenes announcing the withdrawal of passenger services in 1947, showing the effect this had on local residents, before actually boarding the train to continue during the journey. The actors stayed in character on the way to Duffield improvising along the carriages before performing a finale on arrival at Duffield. The finale was great as the characters transformed in to being the original 8 that started to reopen the railway in 2000. A song about the railway was also specially written for the project which we hope to get a copy of soon. Over 100 passengers were on board the 12:10 from Duffield to enjoy it. Down the yard, work continued on the body work of the RF kitchen car which is progressing at a steady pace. Sometimes it is just that little bit too warm to be overly enthusiastic! If Calsberg operated heritage railways, they would have planned a day like today. Glorious sunshine, lots and lots of happy visitors and steam trains travelling along the beautiful Ecclesbourne Valley. Our first Wirksworth to Duffield service played host to various groups associated with the opening of the new Ecclesbourne Way. The party alighted at Shottle Station where guest of honour Sir Patrick McLoughlin, Chancellor of the Duchy of Lancaster met the group and officially opened the walking route much to the delight of all who attended. The 12:10 Duffield to Wirksworth train had a large coach party travelling as well as a private party which meant Helen and her staff working flat out to cater for the ninety plus visitors who required feeding and watering! A sincere thank you to all the catering staff who ensured our guests were well looked after especially in such hot conditions. Down the yard work continued on the Duke and Class 119. No.3 ran frequent break van rides up the incline to Ravenstor which were very popular. June looked after our guests on platform one and was able to take some groups on yard tours. Again today, the railway enjoyed exceptionally good passenger numbers which should keep the bank manager happy. A private charter to Duffield with Iris providing the traction left the station at 17:15. Todays service was supported by the EVRA Shop, Model Railway and booking hall staff. Congratulations goes to John Hastings-Thomson for the time and effort he has invested to ensure a successful launch of the Ecclesbourne Way. Thanks too goes to the steam crews who despite the uncomfortably hot conditions on the footplate, ensured our scheduled services ran mainly to time and finally, a big thank you to all the volunteers who undertook operational or commercial duties today and went that extra mile to ensure the large volume of visitors had an enjoyable and memorable time with us. Still a warm and sunny day on the railway today. An early morning vegetation clearance train went out at 08:00 and came back at around 11:0 before the first service of the day. The service then ran happily all day with it being slightly busier than yesterday. Passengers could spot BBC East Midlands Today out and about at various locations down the line today so look out for a feature on the news from 18:30 this evening. This is a feature ahead of the launch of the Wildlife Trust's Ecclesbourne Way walking route which runs along the valley. Down the yard, the steam locomotives for the weekend were prepared and warmed up and the Class 33 had a repair carried out to the door after a defect developed in service on Tuesday. A hot and humid day for our Thursday DMU passenger service. It was good to see people making full use of the intermediate stations today. It was generally quiet down the yard today apart from a shunt of vehicle around the Maintenance Facility to enable Derek and Dan to give the courier van a quick exterior spruce up. It was discovered yesterday that the rake of coaches had received vegetation scratches along the bottom of all vehicles. I took a party early in the morning with 55006 to remove all overhanging vegetation. Down in the yard the DMU duo completed an A exam on railcar 53599 which had completed over 2000 miles whilst the steam group cleaned all three steam engines inside and out which were then serviced and prepared for their next turn of duty. The ash from the Jinty was emptied and the coal supply was stacked ready for use. In the other shed Cathryn's valve gear was refitted and improved, the window glasses were fitted and the inner frame and wheels were painted. Paul made a mechanism that would activate the lubricator via the motion. Work was started on repainting the courier van in platform 3 where any loose paint and dirt was removed. The sun was beating down as we made history today at our Classic Bus Rally. Today was the first time in the 150 year history of this railway that steam and diesel passenger services have passed each other! The trains were rather busy as everyone enjoyed a riding on the railway as well as classic buses. It has taken some 30 or so staff to put on a day like this so thank you to all involved. Down the yard, work continued on the RF kitchen cars body work. I apologise for the late delivery of this report which is down to an excellent whiskey tasting evening at the Temple Hotel, Matlock Bath. The weather was dry although a little cool at Derbyshire's favourite branch line. We had three steam locomotives in operation with the Jinty on the Wirksworth to Duffield service, Henry Ellison on the Ravenstor incline and Wren on the miniature railway. Congratulations Ron, Jack, Richard and Will who have relayed the track, erected a new platform and extended the miniature railway. Today saw the new addition to our enterprise carry its first passengers. (video on Facebook). We welcomed visitors from near and far today with the furthest being an railway enthusiast on holiday from Tennessee who had travelled from Malvern to ride on our branch line. Passenger numbers on all services were very good today. Down the yard at Wirksworth there was much activity with work being carried out on the Duke, Derby Lightweight, and class 31 which had a break issue fixed. Both the LMSCA and EVRA were also in attendance working on their respective carriage restoration projects. Today's service was supported by the EVRA shop, Miniature Railway, Model Railway and the Booking Halls. At the end of the day preparations got underway to welcome a number of heritage buses for tomorrow's gala. With three steam engines, a three car DMU and heritage bus rides to Duffield and Carrsington Water, it promises to be a great day out.